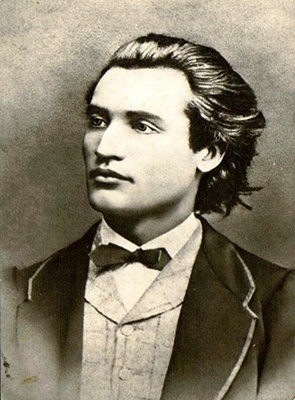 Mihai Eminescu was born in 15 January 1850 at Botosani . He was the 7th of the 11 childs of Gheorghe Eminovici . He was a romantic poet, novelist and journalist, often regarded as the most famous and influential Romanian poet. His first poems volume was published when he was 16 and he went to Vienna to study when he was 19. The poet's Manuscripts, containing 46 volumes and approximately 14.000 pages, were offered by Titu Maiorescu as a gift to the Romanian Academy. Notable works include Luceafărul ("Evening Star"), Odă în metru antic (Ode in Ancient Meter), and the five Letters (Epistles/Satires). And among stars the moon. On the wet, moving, ways. She falls in love with him. She shows to his bright view. A toil of shaking flames. And her sweet eyelash closes. And on her face that turns. So that their souls may hook. Why comest thou not? Come! And over my life gleam!" A superb young man springs. Its top, a crown of reeds! That throw their sparkles out. My mother is the sea. Fate toward thee I steer. And thou wouldst be my bride. Will kneel before thy door." For me's for ever close. And thy eyes chill my heart."